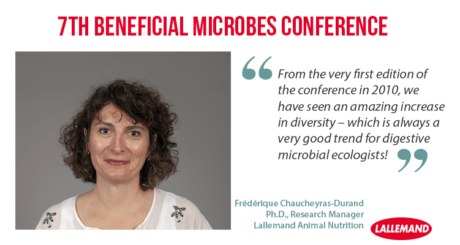 Once again, Lallemand Animal Nutrition was pleased to take part in the 7th Beneficial Microbes Conference. This unique event gathers international scientists to share research on beneficial microbes, which support the health and well-being of both humans and animals. Several studies presented by university professors featured some of Lallemand Animal Nutrition strains and solutions in species ranging from swine and poultry to honeybees. Frédérique Chaucheyras-Durand, Ph.D., Research Manager for Lallemand Animal Nutrition, has been a member of the conference advisory committee since the early days. On November 27, she co-chaired a session on “Pre- and probiotics, animals and animal models”. Konstantinos Mountzouris from the Department of Nutritional Physiology and Feeding at the Agricultural University of Athens in Greece talked about: “Probiotics as key elements of nutritional strategies targeting broiler gut function and health in the post antimicrobial growth promoter era” and mentioned some positive results obtained with Saccharomyces cerevisiae var. boulardii CNCM I-1079 on broiler performance and health. Hicham El Alaoui from Laboratoire Microorganismes: Génome et Environnement, Université Clermont Auvergne in France, presented his team’s research on the preservation of honeybees’ health with Lallemand probiotic strain: “A Pediococcus strain to the rescue of honeybees in decreasing Nosema ceranae induced adverse effects”. Christine Leterrier from Physiology of Reproduction and Behaviour Research unit at INRA in France, presented forward-looking research in a session dedicated to probiotic modulation of the microbiota-gut-brain axis, titled: “Influence of the microbiota-gut-brain-axis on emotional behaviour in quails”. She presented most recent data showing that birds’ microbiota modulation using probiotic bacteria Pediococcus acidilactici MA18/5M from hatching positively influenced birds memory. Finally, a poster presented by Raphaële Gresse, titled “Development of an in vitro model of intestinal dysbiosis in post-weaning piglets” described the validation and application of an in vitro piglet gut model to study post-weaning dysbiosis in swine, developed in the frame of partnership between UMR MEDIS (INRA-University of Clermont Auvergne) and Lallemand. This meeting is an illustration of the broad — and still untapped — potential for probiotic applications in all aspects of animal nutrition and well-being, from piglets to honeybees, and a mark of Lallemand Animal Nutrition’s position in the understanding and managing of gut microbiota ecosystems in all animal species.